I write about the pleasures of sardines today in the San Jose Mercury News (Story now below). Although I realize they’re a tough sell in our culture, there’s a reason they’re so popular in Spanish and Italian cuisines. Their deep savor marries well with the bold flavors of garlic, peppers and citrus. Nate Appleman, the hot young chef of San Francisco’s A16, keeps sardines on his menu all the time. He appreciates that they are sustainable and local but he’s hooked on their flavor. Appleman likes to roast sardines in the restaurant’s wood-fired oven and I included one of his recipes with the story. It’s a simple technique that delivers vivid flavors and appealing textures. A more basic recipe is this one I found in Teresa Barrenechea’s “The Basque Table” (Harvard Common Press, 1998, 232pp, $16.95). The sardines develop a crisp skin and pleasantly moist flesh as they roast in a hot oven. Minced garlic, parsley and breadcrumbs add nice texture as well as complementary flavors. Give them a try. Sardines may well be the perfect fish for our times. Preheat oven to 450 degrees. Rinse and dry sardines. Sprinkle with salt. Pour oil into a shallow baking dish large enough to hold the fish in a single layer. Lay sardines in the dish, turning them once to coat with oil. Scatter garlic, parsley and breadcrumbs over the fish. Bake about 10 minutes, just until the flesh is cooked through. Pile salad greens in the center of a platter and arrange sardines around the edge. Serve. It’s healthy, sustainable, flavorful–what’s not to like? Consider the humble sardine: Low in mercury, high in healthful Omega 3 fatty acids, and abundant once again in the chilly waters of Monterey Bay, it may be the perfect fish for our times. Sardines are one of the few species that environmentally conscious diners can devour without guilt or serious damage to their budgets. The Monterey Bay Aquarium’s Seafood Watch program gives them the green light as a best choice for sustainability. The surprise for many Americans is how delightful sardines can be when prepared fresh. If your only experience with sardines has been mushy, oily fillets out of a can, you’re in for a treat. Fresh sardines, straight off the grill with a squeeze of lemon, are milder than you might expect, with meaty flavor, crisp skin and a delicate texture. The high oil content — the source of all those Omega 3s — gives them a deep savor that holds its own with the bold flavors of garlic, peppers and citrus. Long a favorite in Mediterranean cuisines, the little silver fish are growing in popularity in Bay Area food circles, where sardines star on the menus of hip restaurants and sell out at farmers markets. Nate Appleman, this year’s James Beard Rising Star chef, is a big fan, He serves sardines draped atop bruschetta, roasted with green garlic and mint, or tossed with pasta, capers and garlic at his acclaimed San Francisco restaurant, A16. As much as he loves the full flavor and versatility of sardines, the chef also appreciates the fact that sardines are an environmentally sound product pulled from local waters. “We’re committed to being as sustainable as possible. Sardines are as sustainable as you can get. They’re on the bottom of the food chain,” Appleman says. Early July is the best time to find fresh sardines, whether at farmers markets or at upscale grocers such as Whole Foods. The next segment of the sardine fishing season begins July 1 and is expected to last only a couple of weeks, according to Diane Pleschner-Steele, executive director of the California Wetfish Producers Assoc. Sometimes commercial boats get a small proportion of sardines out of season as a by-catch when they’re fishing for mackerel, anchovies or squid, but that availability is not predictable. When fresh sardines are available, Hans Haveman, of H&H Fresh Fish Co. based in Santa Cruz, says he sells 100 to 150 pounds a week at the 10 farmers markets he works between Monterey and Oakland. “Personally, I like them with just olive oil on the grill,” Haveman says. “What I was doing last year, which is a nice recipe, was roasting tomatoes alongside the sardines.” The roasted tomatoes went into a blender with a little balsamic, good olive oil and salt and pepper to taste to make a bright sauce for the fish. Fresh sardines aren’t available year-round because the harvest is tightly managed by the federal Pacific Fishery Management Council, which works to forestall a fishery collapse such as the one that finished off Monterey’s formerly thriving cannery industry in the 1950s. Although the sardine population is known to fluctuate naturally, over fishing was suspected as a factor in the disappearance of the fish from the bay at that time. Kenneth Coale, director of Moss Landing Marine Laboratories, hopes to raise the status of the fishery by making sardines more appealing to the average American. The labs recently bought an off-loading facility at the Central Coast fishing harbor to support the local sardine fleet. Now Coale is looking for a way to acquire a filleting machine and package cleaned fillets to be sold to consumers in convenient, frozen form. A solid domestic market could pay fishermen more per pound so they wouldn’t have to catch so many fish to make a profit, he contends. That would take a lot of pressure off a fishery that feeds other marine species and birds as well as humans. Place flour in a shallow plate and season with salt and pepper. Dust sardines, inside and out, with the seasoned flour. Heat ¼ cup olive oil in a large skillet and fry sardines along with 1 clove garlic for 3-4 minutes per side, until golden. Remove sardines to a shallow serving casserole. Discard garlic and wipe out the skillet with a paper towel. Add remaining ¼ cup oil to the skillet. Warm pan over medium heat and sautÃ© the two remaining garlic cloves until golden brown. Add vinegar, wine, bay leaf, thyme, paprika, orange zest and peppercorns to the pan. Bring mixture to a boil and simmer 3-4 minutes before pouring it over the fish. Cover fish and refrigerate at least 2 days to allow flavors to develop. Bring to room temperature before serving. This may be the best way to cook sardines. It’s certainly the simplest. You could dress the fish up with paprika, capers and garnish with fresh parsley if desired. Just don’t skip the lemon. Its bright, sharp acid cuts through the oil and complements the flavor of the fish. Place sardines in a single layer in a shallow dish. Mix olive oil and garlic together in a small bowl and pour over the fish. Squeeze the juice of the lemon halves over all. Turn fish over several times to completely coat with the mixture. Salt and pepper to taste. Over a hot fire, quickly grill sardines until the skin is seared and the inner flesh has turned opaque, 3-4 minutes per side. Remove heads from sardines. Gently pry open the belly of each fish to expose its backbone. One at a time, place fish, skin side up, on work surface and press firmly with the palm of your hand to loosen the spine. Trim off the back fin and turn fish over. Starting at the head end, remove the backbone by pulling it toward the tail in a single motion. (Part of the tail may come off with the backbone.) Rinse sardine under cold running water, removing any loose bones, and pat dry. Repeat with remaining sardines. 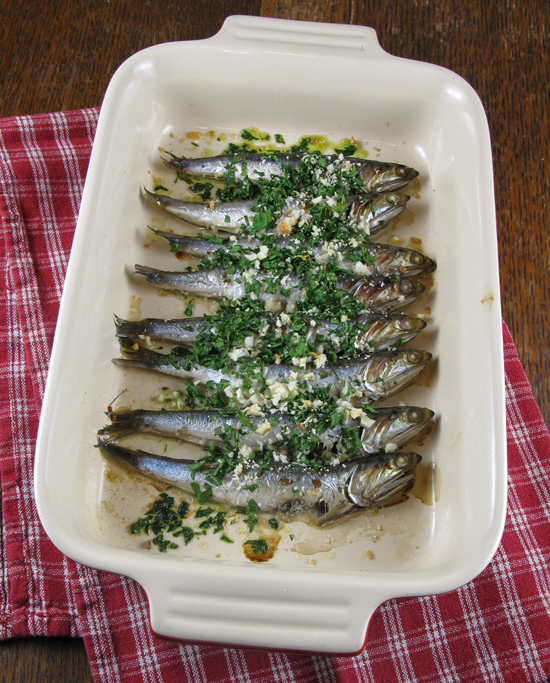 Arrange butterflied sardines on a baking dish, skin side up. Season both sides with salt and brush lightly with olive oil. Roast for about 5 minutes, skin side up, until sardines are cooked through and skin begins to sizzle. Meanwhile, heat a couple of tablespoons of olive oil in a small skillet over medium heat. Add green garlic and sautÃ© for about 1 minute, until softened. With a slotted spoon, remove green garlic and set aside. Turn heat to medium low, add a couple more tablespoons olive oil to the pan and sprinkle in the breadcrumbs. SautÃ© for about 2 minutes, until the breadcrumbs crisp up and darken slightly. Remove pan from heat and stir in the green garlic, capers and mint. Set aside until serving. Transfer sardines to a serving platter. Squeeze lemon over the top, sprinkle with bread crumb mixture and drizzle with additional olive oil to finish. Serve immediately. Note: If you can’t find green garlic, substitute green onions. Hate to ask a dummy question, but once cooked what do you do with the little buggers. Grab it by the head and bite the rest of it off, take off the tail first than nosh, remove any of the crispy skin, etc..
Are you back from Alaska? Welcome home! I enjoyed the article in the Merc, and I’ve been enjoying fresh sardines at Sushi Kazoo in Willow Glen. I’m with you on not eating fish as often; the whole subject has become a minefield. What is the best way to fillet the sardine. When grilled fresh, the bones never get as soft as in the can & they just don’t taste very good. I love the taste of grilled fresh sardines but hate the bones. Any suggestions? About cleaning sardines…from the pictures, it seems the skin is typically eaten, but do sardines need to be scaled as part of the prep? About bones…do you usually eat around them, or are they soft enough to eat? I so wish fresh sardines were easier to come by around here. None of the markets carry them, not even Whole Foods. I love them! If you’re willing to clean them, frozen sardines are pretty good, too. That’s the only way some of the fish markets here carry them. I used some for photos this spring. Fresh, though, is better, of course. Hate to break this to you, but those are anchovies in the picture, not sardines. Definitely large anchovies, but the mouth is wrong for either the Pacific or Atlantic sardine — not that it matters too much from a cooking standpoint, as they are both good eats. To fillet sardines you butterfly them. Split them along the backbone, and snip the tail and head end of the backbone with a knife or shears. GENTLY lift up the back bone from the tail end, pushing the meat back down as you move toward the ribs. The ribs will lift out, leaving you with a fillet. After you get the hang of it, you can do this in about a minute. To grill sardines, stuff the butterflied fillet with yummy stuff and then wrap in a grape leaf. Paint it with olive oil and grill gently. Anyway, those are my $0.02. PS – Elise, go to the Davis Farmer’s Market on Saturdays; they have fresh sardines on occasion. Hmmm. I’m not an ichthyologist and they were labeled as sardines where I bought them. They looked right to me and they were quite tasty. Thanks for your illuminating comments. I usually cook them whole and just use a fork or knife to lift the fillet off the backbone when I’m eating them. It’s probably even easier to cut the head and tail off, first, but I don’t bother. Your approach to grilling sounds very good. Stuffing and grape leaf wrappers are a nice touch. Still, sardines are exceptionally good just brushed with olive oil, grilled, and anointed with a squeeze of lemon when they come off the fire. I loved your artcle in wednesdays contra costa times so much so that i went to the berkeley marina early this morning to buy live freash sardines from a guy that sells them to fisherman dock K in case anybody wants to buy them. anyhow im gonna bbq them tonite and im so excited to see how its gonna taste. i made an avacado butter with soy sauce and green onions. i`ll chop tiny pieces of lemon and bazel put them inside the fish and coat them with olive oil. im gonna serve steamed breen beans red potatoes and a green salad and white wine….thanks for the idea. Sounds fabulous Donny. I hope they turned out well. Your article has disappeared from the Mercury News online archive. Do you own rights so you can include it here in Skillet Chronicles? I do own the rights. I’ll track the copy down and add it to this post. Thanks for bringing it to my attention, Ken. Pingback: Looking for Mr. Goodfish: Chefs aim to expand our seafood horizons :: The Ethicurean: Chew the right thing.